Although my stats show a lot of visitors, I’ve gotten very little feedback on my last two posts (and I am very grateful for the feedback I did receive), so perhaps I am just asking questions that can’t be answered—or that need to be answered by an expert. But here is one last attempt to figure out who these people are in this photograph. Please let me know what you think. 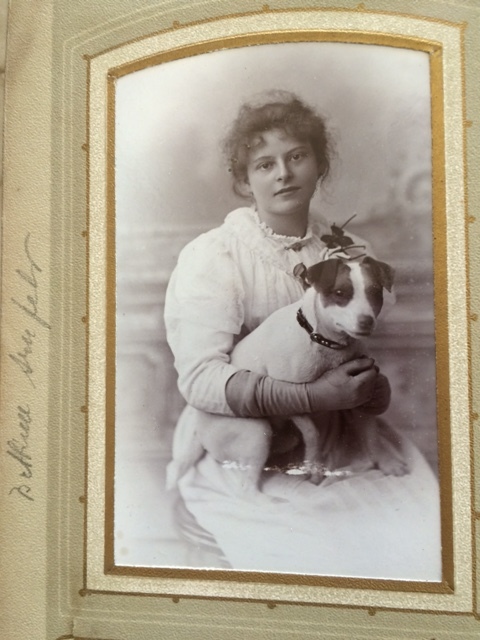 On the advice of my cousin Pete, I consulted a few web sites providing fashion information for the purpose of dating photographs, and it seems very likely that this photograph was taken sometime between 1890 and 1905. I can’t narrow it down much more than that based on the clothing. Who are these people? When was this taken? Today I am focused primarily on the man on the right, who is labeled Onkel Adolf. 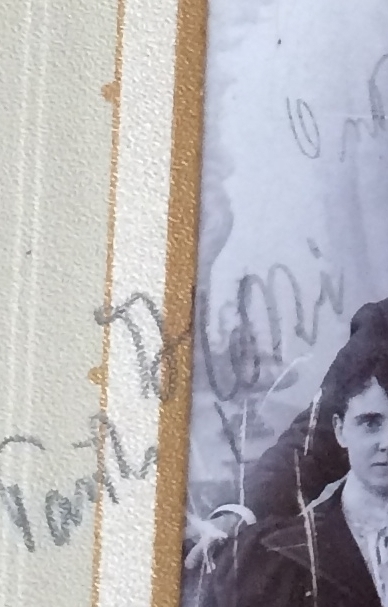 I have only found two Adolfs in the extended Seligmann family. One is Adolf Arnfeld, Bettina Seligmann‘s husband, but this is Bettina, and she is not in the group photo, so that makes no sense. 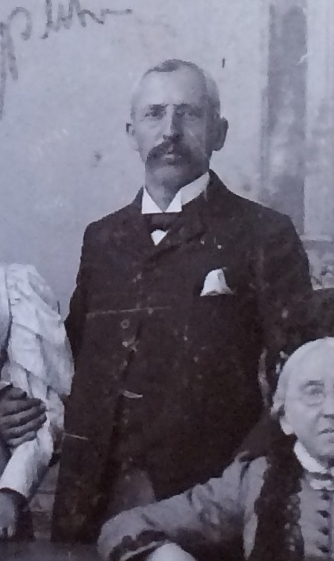 The second Adolf was Adolf Seligman, my three-times-great-uncle who immigrated to Santa Fe and settled there. He did make a trip to Germany in 1900, so this photo might have been taken then. Adolf was born in 1843, so if the photo was taken in 1900, he would have been 57. Certainly the man in the photograph looks about that age. 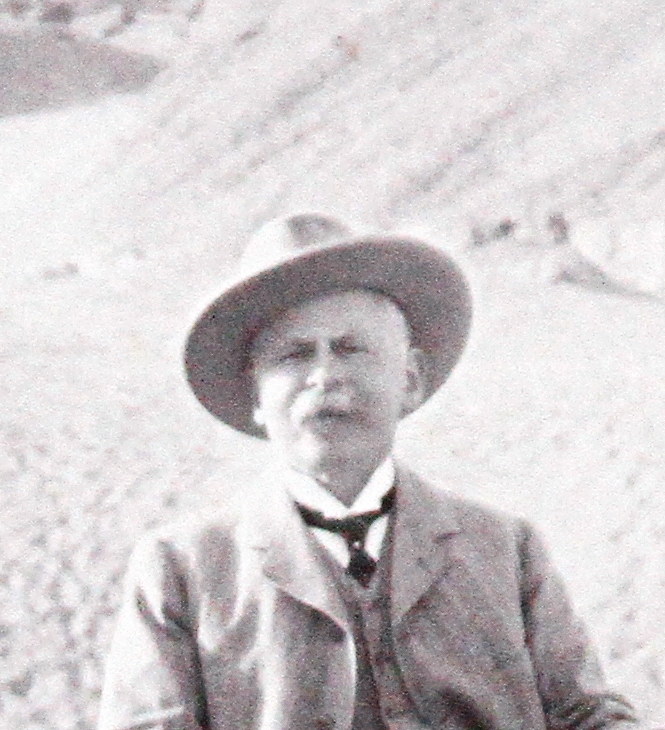 Fortunately, Adolf’s granddaughter Davita recently contacted me after finding the blog, and she sent me this photograph of her grandfather on a trip to Egypt. Adolf died in 1920 when he was 77, and I would guess he was between 65 and 70 when this photograph was taken. Is this the same man as Onkel Adolf in the group photo above? To me there is similarity in the eyes, mouth and ears, but the older man has a fuller face (just as the older “Babetta” has a fuller face than the younger one). What do you think? 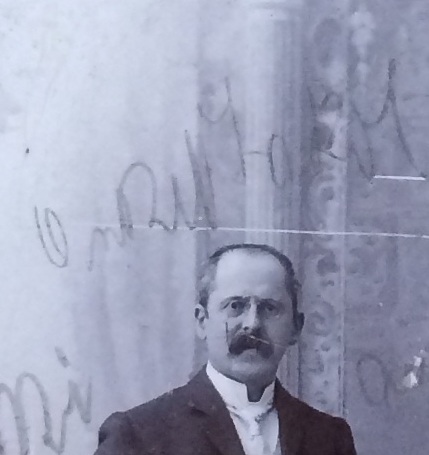 The other man in the group photograph is labeled Onkel Jakob. 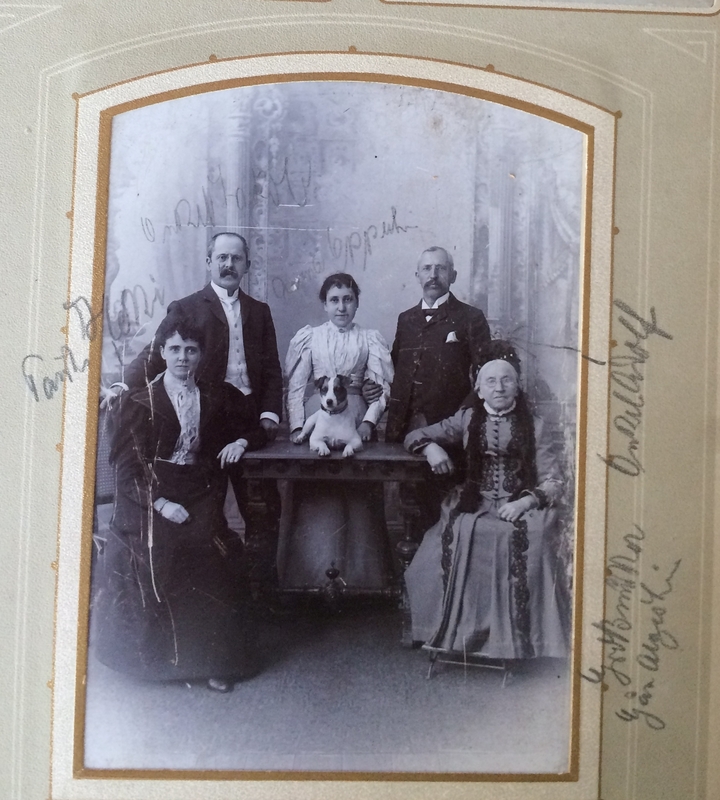 Since I can’t find a Jakob Seligmann who would fit into this photograph, I am wondering whether it could be James Seligman, the brother who immigrated to England and whose estate was the reason for all those Westminster Bank family trees. Perhaps James was born Jacob and Anglicized his name when he immigrated? Since I have no birth record for James, I do not know. If the two men are Babetta’s sons Adolf and James, it would make sense that the two women are either their wives or their sisters. Adolf married Lucille Gorman in 1902 when she was nineteen and he was sixty. The woman standing next to Adolf does not look that young nor is she labeled with any name that looks like Lucille or Lucy. James Seligman’s wife’s name was Henrietta, and the name above the woman next to him does not look at all like Henrietta. So could they be sisters of Adolf and James? Could the two women be two daughters of Moritz and Babetta whom I just had not yet found? After all, I had no birth record for James, but only learned of him because of the settlement of his estate. Perhaps there were other children born to Moritz and Babetta. There is a six year gap between Pauline’s birth in 1847 and James in 1853, time enough for two more daughters. One other reason I think this is possible is that Davita told me that her grandfather Adolf’s favorite sister was Minnie, depicted with him in the photograph in Egypt. But I have no record of a sister named Minnie. Both Bernard and Adolf named a daughter Minnie, so this does seem to suggest there was a Minnie in the family. But….neither of the women in the group photo is labeled Minnie. Here is a closeup of Minnie from the Egypt photo and a closeup of the woman on the left in the group photo. Same person? The nose and mouth are similar, as is the hair. Again, the woman in the Egypt photo has a fuller face, and it’s hard to compare the eyes since she is squinting into the sun, but it could be the same person, couldn’t it? But that name above her head doesn’t look like Minnie to me. So who are these people? I am as confused now as I was when I started. Please let me know what you think! This entry was posted in Germany, Photos, Seligman/Seligmann and tagged Adolph Seligman, Egypt, England, Germany, Photos, Seligmann by Amy. Bookmark the permalink. The way each man has his right arm around one woman makes me think that they are married couples. But I suspect the way family members would be arranged and physically interact in a formal photo might vary with culture and time period, so one thought is to look at family groups of known siblings in the same cultural context and see how brothers pose with sisters. This just seems proprietary to me! Thanks for your thoughts. I will do that. But..do you think the faces from the photo in Egypt match the faces of those in the family portrait? That’s really what I am looking for right now. Thanks! I wish i could add something, but regrettably I cannot. Happy 4th. Thanks, Bruce—happy 4th to you and yours as well. If you have any opinion about whether those two photos are of the same man, I’d be interested. Same with the two women. I know you have a good eye for these things. So sorry! I will read over the long weekend! It’s the time of year. We have to work twice as hard ahead of vacation! Then you really need it! Happy fourth to all! Thanks! Any time—I would really appreciate the feedback. As you note, one or two of the faces are quite a bit fuller than the faces you are trying to match. Big clue, I think. Perhaps, but my face is fuller than it was 20 years ago also. It could be aging, or it could be different people. Thanks! 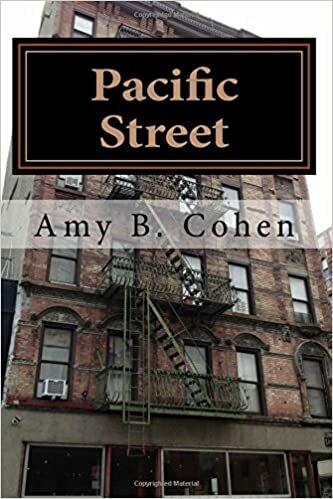 Amy, In looking at the faces of the young and older men, if you drew an upside down triangle from the outside edges of their eyes to the tips of the noses, they are both very similar in terms of triangle shape. They also have similar moustaches. they also both have high foreheads and the left ear on each man is similar. However, aside from the fuller face, the younger man’s face seems much longer than that of the older man. His nose also seems to be a lot longer than the older man’s. I think they might be related, but I would tend to say these are two different men. Thank you for your thoughts. I see your point, though I still think some of that may be aging and the angle of the photographs, etc. I just can’t find another Adolf who would fit in terms of age. But who knows? Do you think the woman on the camel is the same woman on the left in the older photo? 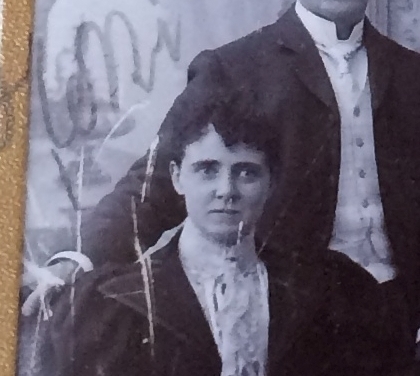 I wouldn’t date this photo past 1900, and probably the mid 1890s. 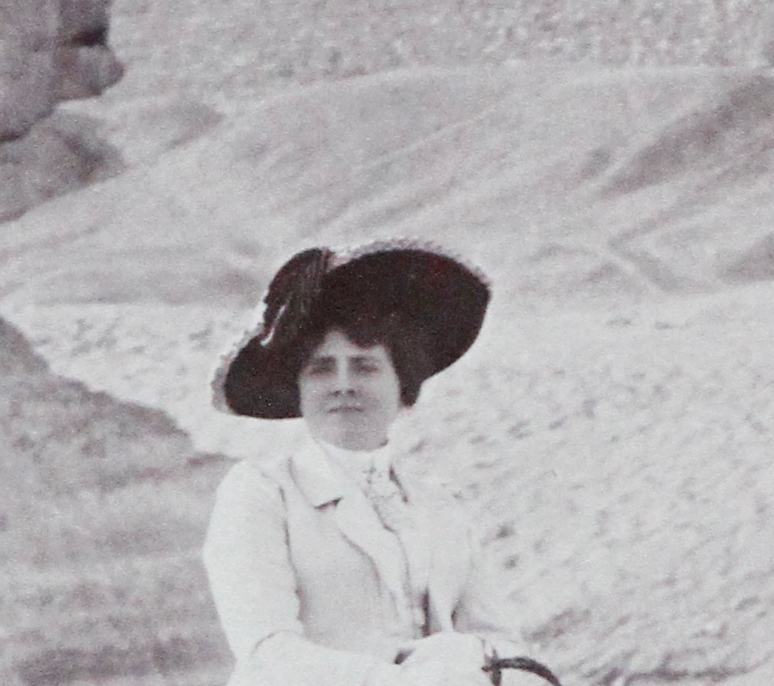 The woman seated on the left has very wide lapels on her jacket, and very large sleeve caps. The woman standing in the center the sleeve caps on her shirtwaist are also very large. Thank you so much, Deborah! I really appreciate your expertise. I was leaning to the 1890s, but wasn’t sure I was reading the fashions correctly. Thank you! When I get back home, I’ll try to look at some of my reference books. Amy, I think you are probably right in all cases. My analysis is similar, based on the features. But part of this analysis relies on connection circumstantial evidence and there could be a gap that causes it all to go wrong. That’s just a little caveat to my first statement. For instance, the men actually look enough alike, if you take their features apart, one by one, that they could age into a very similar look. Does that make sense? It’s not as if you are comparing people who are unrelated. The woman on the camel I am less sure of. I see that most of the features are similar but because her body expressions are so very different, it’s hard to say for sure. they look like different personalities, but that doesn’t necessarily mean anything. I’d say 90% chance you are right ;). By the way, the camel photo is ASTONISHING. Thanks, Luanne! I agree about the camel photo–that really threw me for a loop! 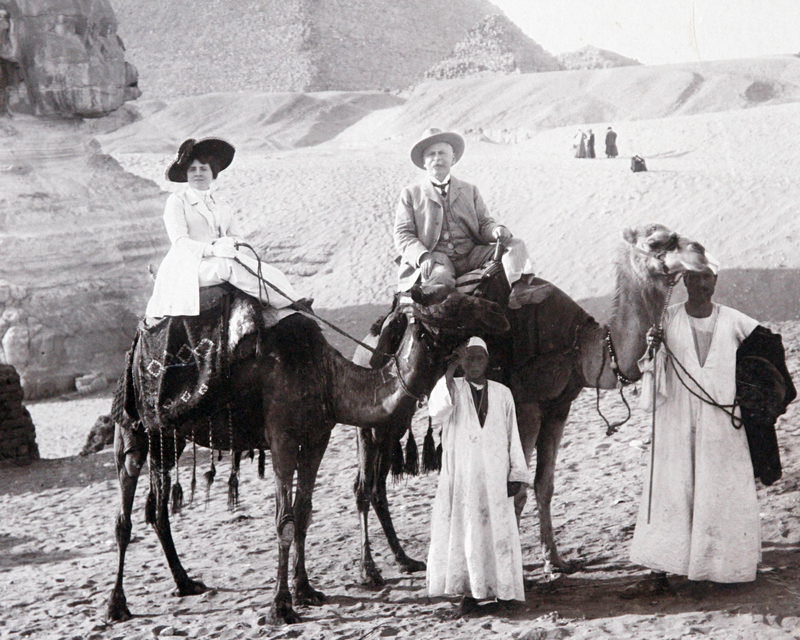 My old German-Jewish ancestors riding around the Egyptian desert on camels—what would the Pharoah have said about that! Thanks for your insights. I am feeling fairly sure about the two men being the same person also—especially since I can’t find another “Uncle Adolf” who would fit. As for the women, it is harder because we can’t see the eyes of the camel woman. The eyes of the woman in the group photo are so distinctive. I am hoping more photos surface. I agree! The dog is pretty cute also. I wrote my latest fashion post with you in mind. I talked about Leg o’ Mutton sleeves specifically. The top photograph in this post definitely has a couple examples of the sleeve. I haven’t seen it—I must have missed it. I will go look! Thanks!! Found it, as you saw! 🙂 Thanks!! I’m horrible at comparing photos. But I think the young man has a different nose tip than the older man. But the ears look the same to me. So… I don’t know. But I mostly wanted to comment on “Minnie” — in an Irish family, this would be a nickname for Mary or Mary Ellen. Maybe for a German Jewish family it would be Meriam or something? Unfortunately, I can’t make sense of the handwriting. Hope this helps a little. Good luck with figuring this all out! Thank you! That’s an interesting insight about Minnie—I will have to back and check to see if there was someone with that name. I know there was a Martha—who knows? They might have called her Minnie! Thanks for your thoughts. That’s what I think also. But I can’t find anyone in the family with that name. Thanks!